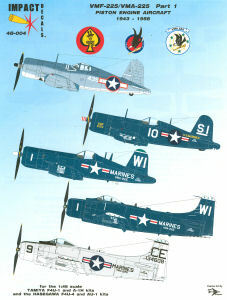 This latest release from Impact Decals is Part 1 of a series depicting the aircraft of Marine Fighter and Attack Squadron 225 'The Vagabonds' during their years flying propeller-driven combat aircraft. 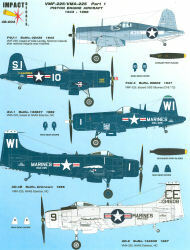 This set starts off the VMF-225 history with a 1943 F4U-1 birdcage Corsair followed by an F4U-4 while they were deployed aboard USS Siboney in 1947. 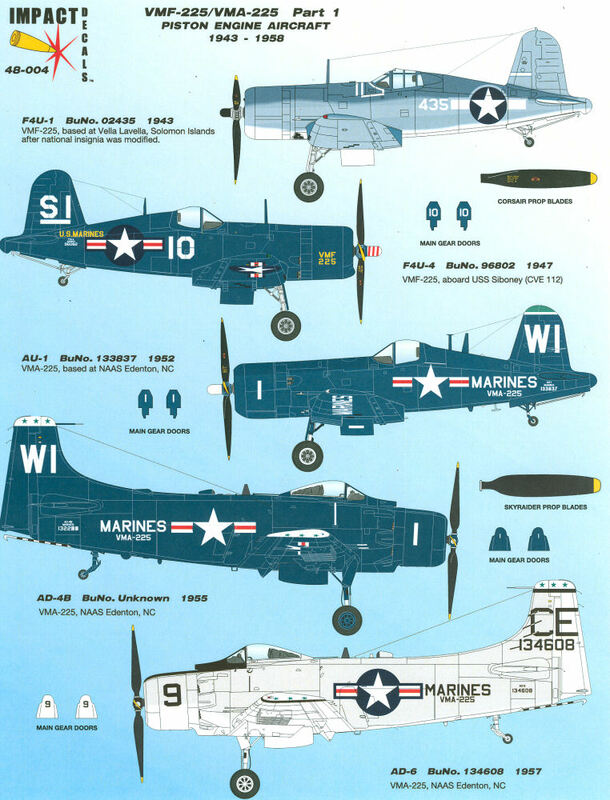 The squadron was redesignated as an attack squadron and they became VMA-225 flying the AU-1 Corsair. In the mid-1950s, the Vagabonds had transitioned into the SPAD (A-1 Skyraider) and operated that type for several years prior to transitioning into turbine-powered aircraft, but that part of their history will pick up with Part 2 of this series. 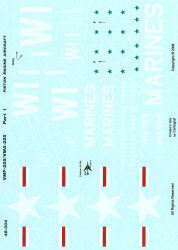 These markings are nicely designed and printed, with this set of two sheets providing sufficient markings to render all five aircraft, including sufficient national markings. 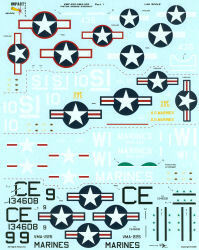 This set will definitely do some distinctive USMC aircraft using Hasegawa and Tamiya Corsair kits, as well as Tamiya Skyraiders. Impact Decals can be purchased directly from their website at www.impacthobbydecals.com. My sincere thanks to Impact Decals for this review sample!